Here’s another set of photos that are different from my usual shots. The sun was already setting so I was running out of light again. (What’s new?) The photos came out surprisingly dramatic. I find it to be a nice contrast to my floral outfit. Instead of the usual bright backdrop, it’s the cityscape and traffic lights behind me. If you live in a tropical country like mine, I’m sure layering isn’t always wise. If it gets too hot, why not try wearing your coat as a top instead? Just cinch it at the waist like this and you’ve got a whole new look! 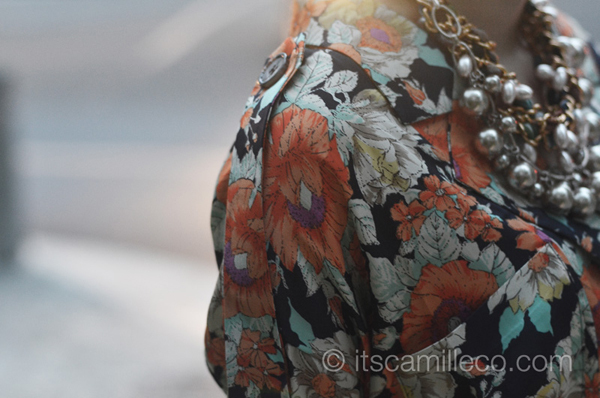 When I first saw this floral coat from Oh My Frock, I actually found it to be really unique. What attracted me to it were the little details–the giant pocket flaps, the straps and buttons, the gathering on the waist. 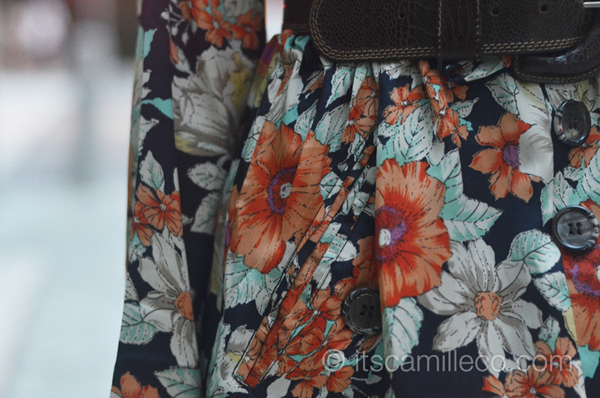 Come to think of it, it kind of looks like a detective’s coat… except it’s in florals! 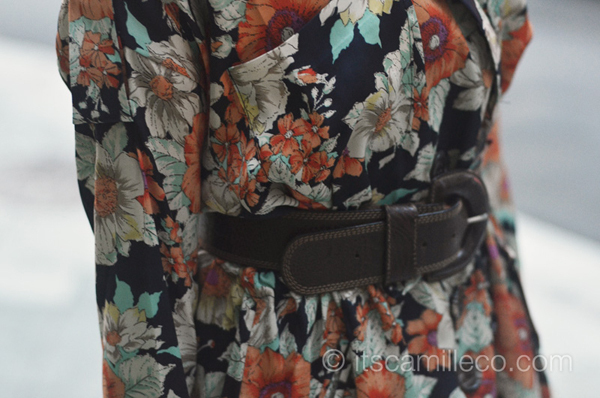 Floral prints almost always look good with the color brown. That’s another tip for you. Whenever you’re wearing a print inspired by nature, pick a color from nature itself. Mother Nature knows best. LOL. Please check out my new post and if you would like to follow each other let me know BY simply leave a comment with your URL. 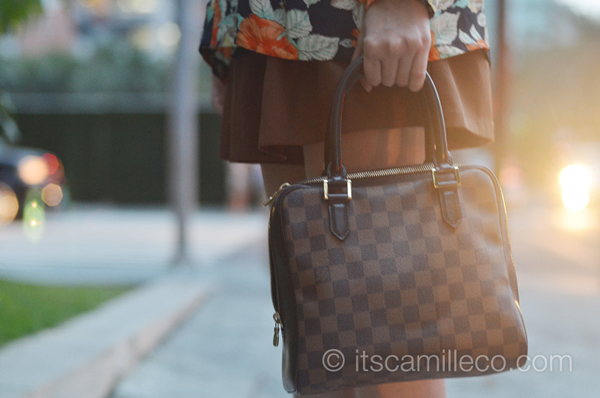 in love with the floral coat <3 and again, perfect bag for the look! classy and sophisticated as always! :) love the bag! I love the top =)) Pretty!!! Why did you leave? :) Welcome back! :) Thanks Yen! I think that little light left from the sun and the color of your outfit matched perfectly well. It gives off that Manhattan feel in your photos. As we regularly see from New York-ers, theire style is mostly consisted of trench coats, especially when it’s near Christmas already! Haha. I think wearing that piece is the easiest solution when you have to be dressy for some reason. :) Oh and, Ate Camille! Thanks for being one of the greatest source of ideas when it comes to print and color-matching. I read this quotation in an application installed in my phone and I want to share it with you!! “I think the idea of mixing luxury and mass-market fashion is very modern; wearing head-to-toe designer has become a bit passe. It’s a new era in fashion – there are no rules. It’s all about the individual and personal style, wearing high-end, low-end, classic labels, and up-and-coming designers all together. i love how the 4th photo captured!!!!! 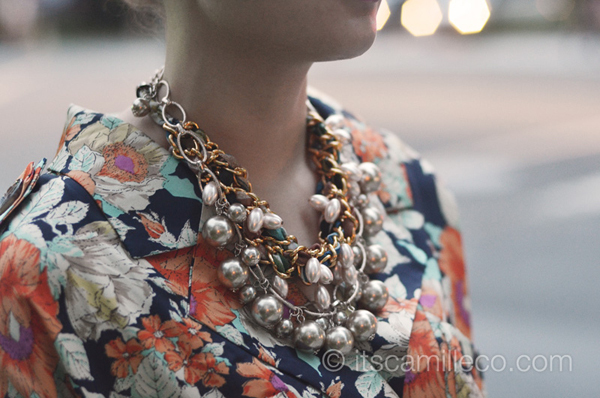 From afar, your necklace looks similar to Caroline Channing’s. Sophisticated! Hahahaha I really have the best readers in the world! You guys are so funny! Hi miss Camille! I have sent you am email about sending you bling ear cap! Hope to here from you soon! Hi! I emailed you before about having a gown made but it didn’t push thru coz i didn’t really have an event for it. But i just got recently engaged and you’re one of my go-to designers!!! I really like how you combine sophistication, elegance with some sexiness and the showing off some skin. I hope to visit your atelier soon! I was hoping to send you some but wondering how to go about it. I don’t know! :) For the d7000, I’ll email you! Excellent climate of photos! Beautiful outfit and even more beautiful necklace. Wonderful outfit! I am in love! You really look like a Barbie doll! Far from one but thanks Kaye! Might I suggest investing in an LED light or the Olympus external flash? The bright colours on the top are kind of lost from the lack of light. Other wise I can imagine this having that nice autumn feel. Dramatic indeed. I heard you’re selling your Nikon dSLR right? What cam are you planning to get? And are you keeping your Olympus dSLR?